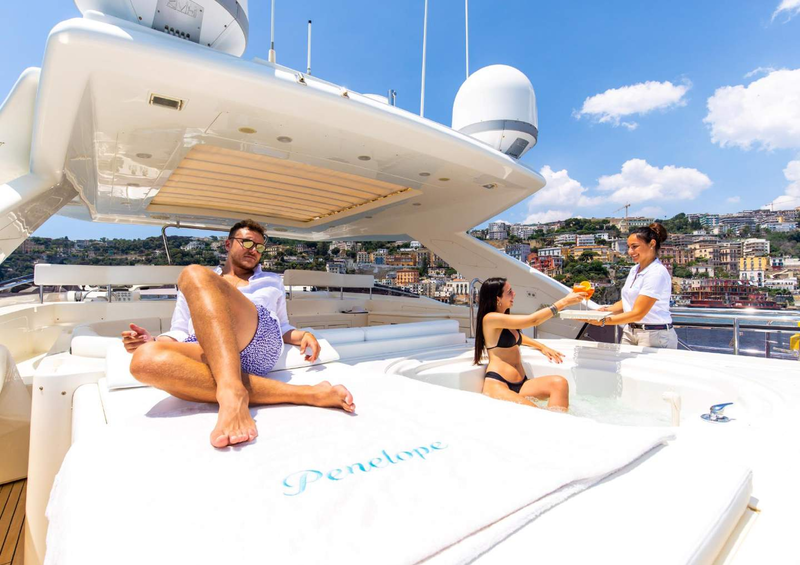 Measuring 30.00m (98' 5”), luxury motor yacht PENELOPE (ex BAOBAB) was constructed by the renowned Italian yacht builder Ferretti and launched in 2008. 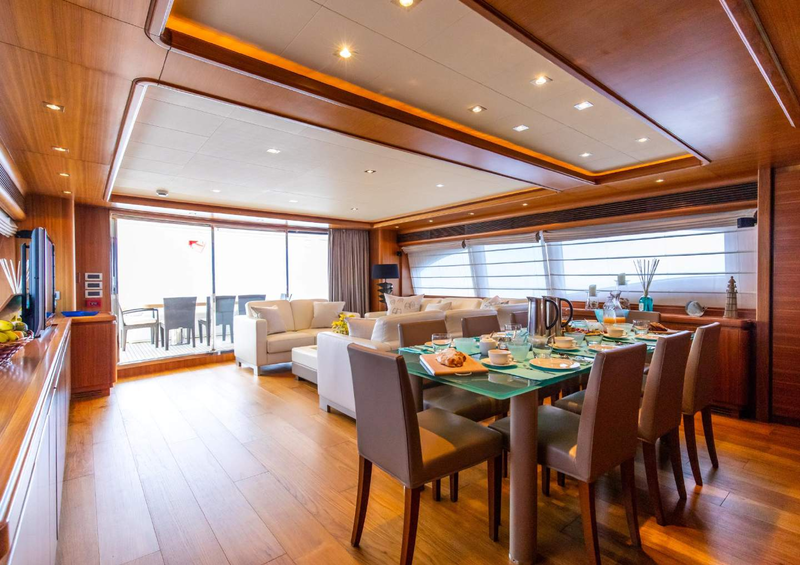 She was refitted in 2018, offering modern and inviting interior and exterior decor, with accommodation for up to 10 guests in 5 cabins. 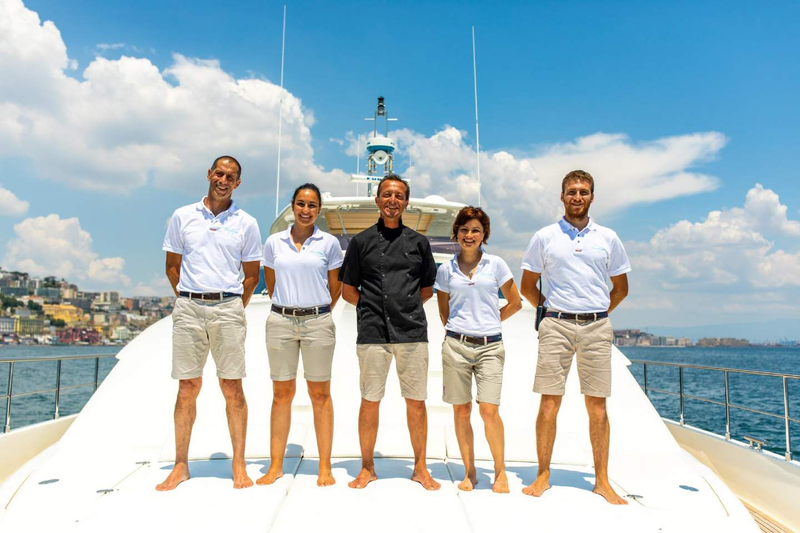 Her crew of 5 is onboard to assist and service during the entire charter vacation. 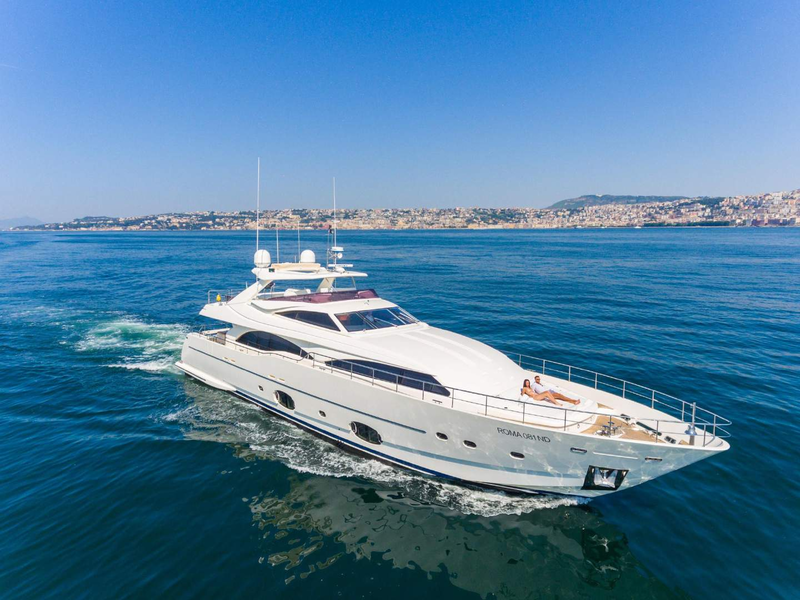 The lower deck transom door opens up to create a large swim platform for sunbathing close to the water and a staircase leads up to the main deck aft. 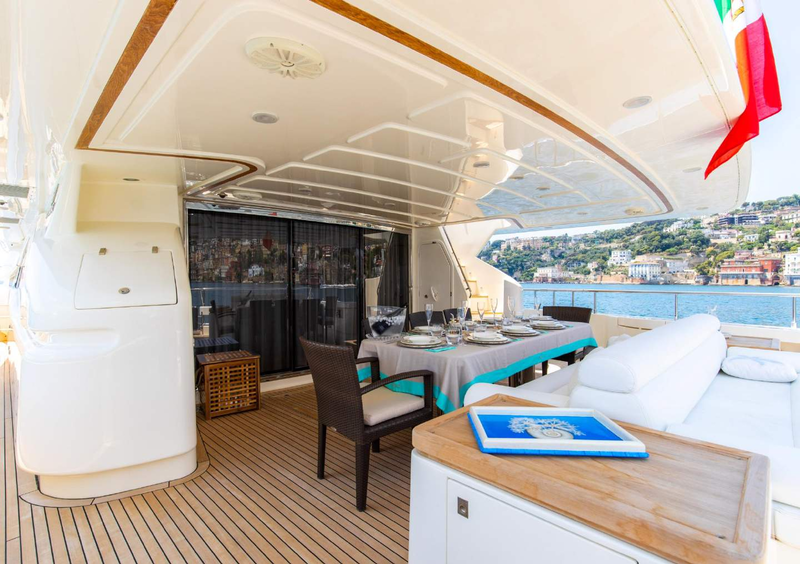 Here, guests can choose to sit facing out across the sea or face forward to use the raised table with the additional chairs for alfresco meals. 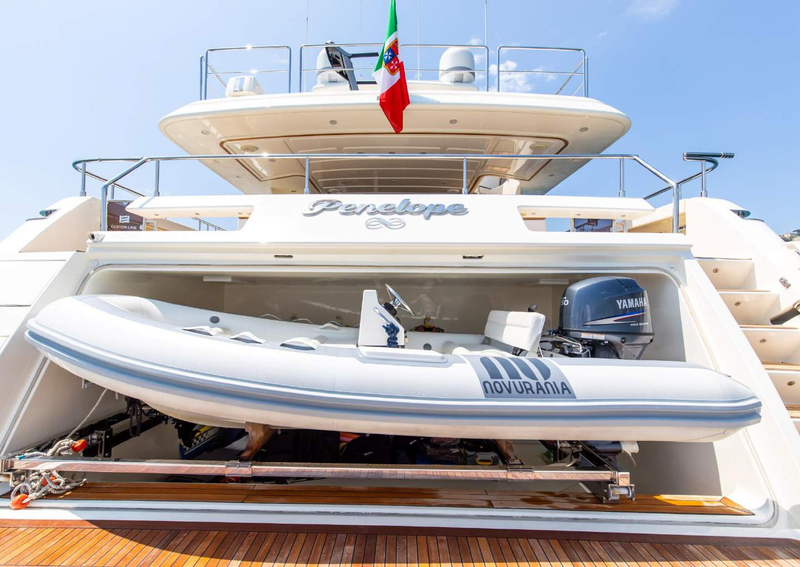 A spread of sun pads covers the foredeck in front of the helm station with a tender stored underneath, and up, on the sun deck, there are additional sun pads along the stern with the Jacuzzi placed underneath. 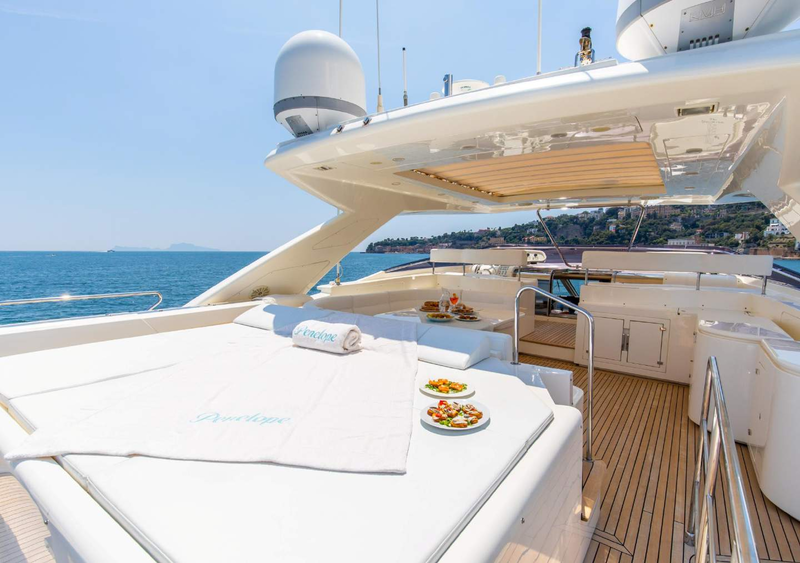 The roof has a retractable soft-top so that guests can lounge in the sunshine or shade while seated at the port C-shaped sofa and table. 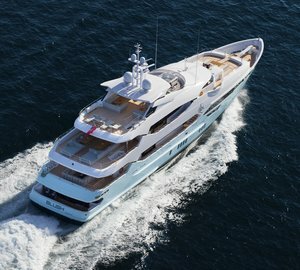 A treadmill is also available on this deck for alfresco exercise in the fresh air with uninterrupted views. Rich wooden panelling, matching floorboards and natural furnishings in white, cream and stone decorate the interiors for functional and atmospheric minimalist interiors. 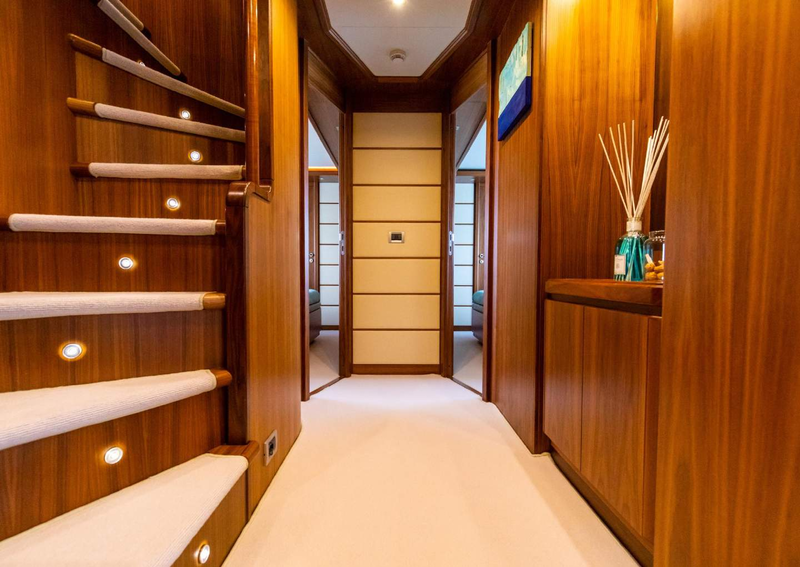 The lower deck contains a tender garage in the stern and the engine room aft of the guest accommodation, which consists of two double cabins side-by-side and two adjacent twin cabins. 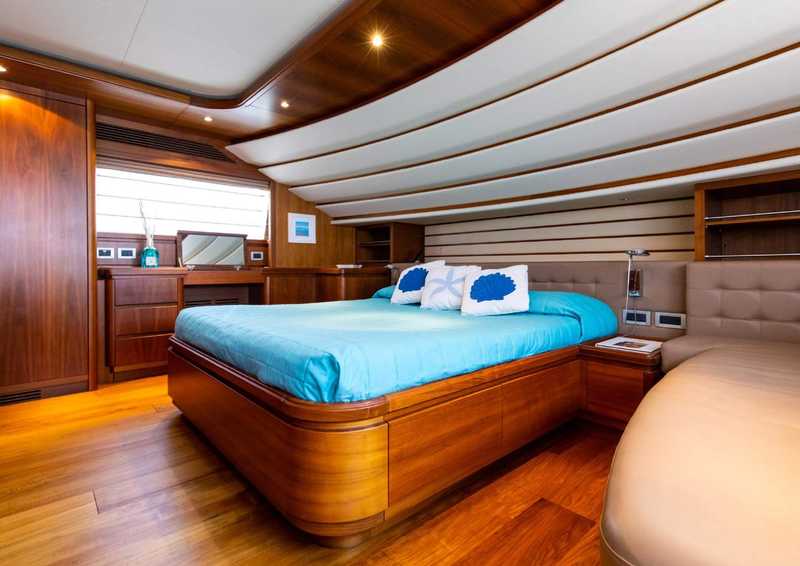 The crew accommodation and amenities are placed within the bow. 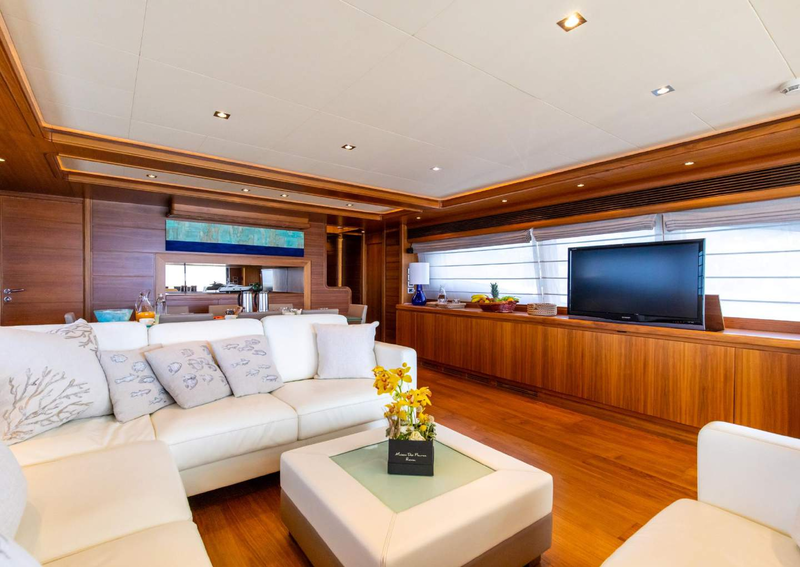 The main deck forward hosts the Master suite, within which there is a day bed, vanity, large wardrobe and en-suite bathroom. 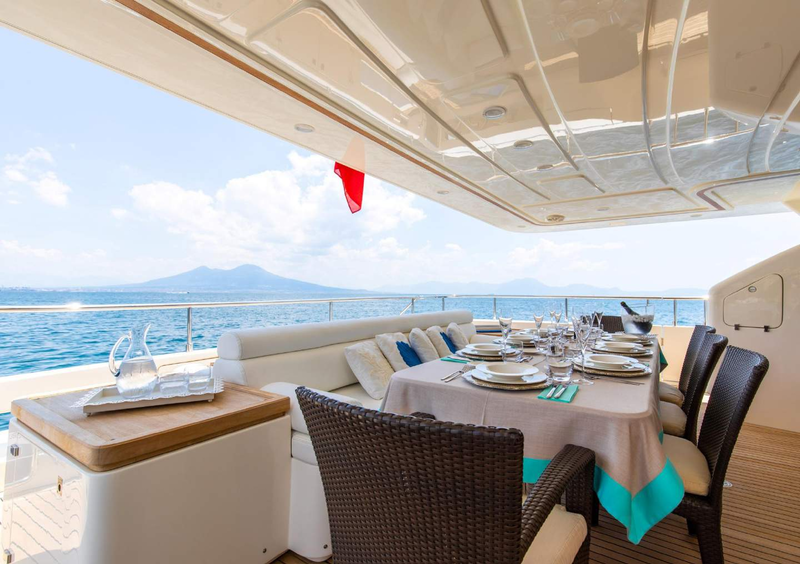 To the aft, the formal dining area seats up to eight guests in understated elegance and after a meal the group an rest on the C-shaped sofa around the drinks table. 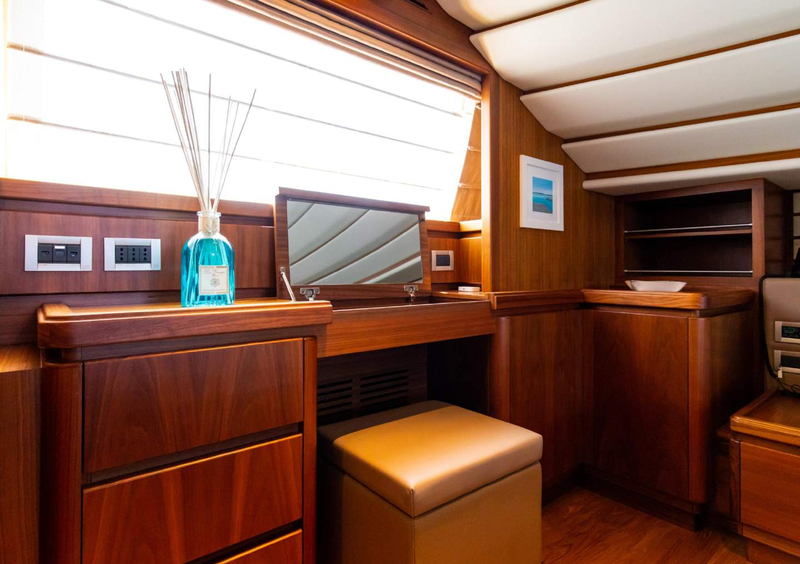 A widescreen TV raises up out of the cabinetry for entertainment in the evenings and during transit. 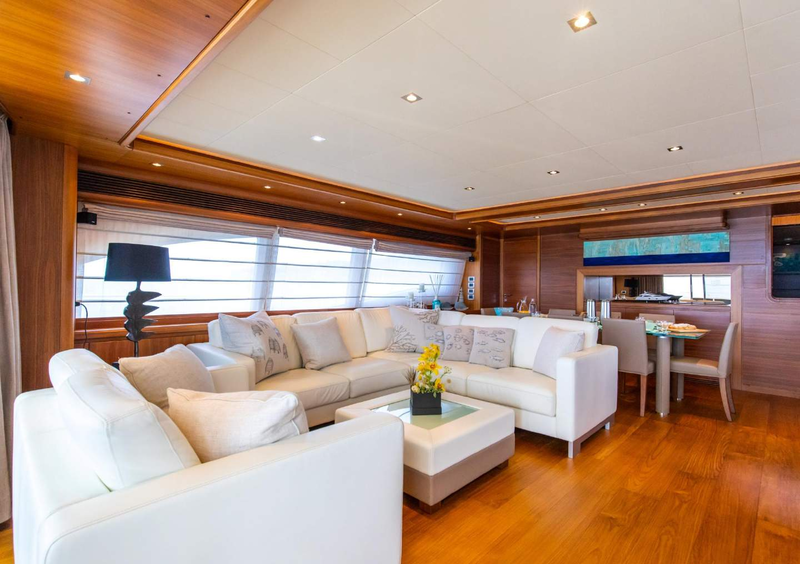 The wide glass doors to the aft can be opened for fresh air and to create an indoor/outdoor flow during events. 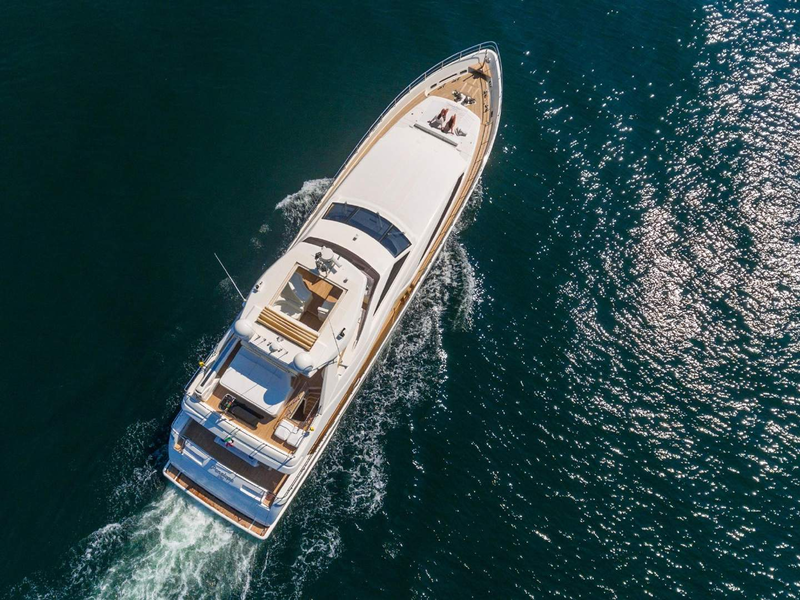 Above, the sundeck contains an L-shaped sofa where guests can take in the forward views and enjoy cruising from one location to the next. 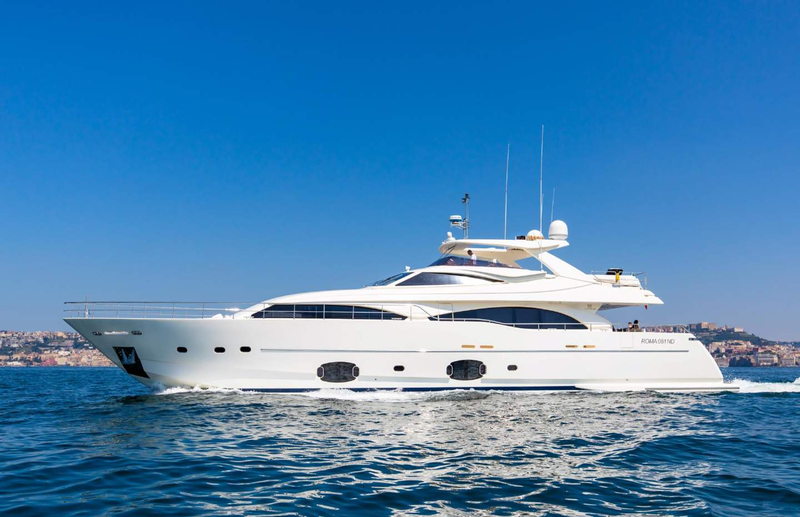 A pair of MTU engines producing 2,400 HP produces a top speed of 27 knots and a cruising speed of 20 knots. 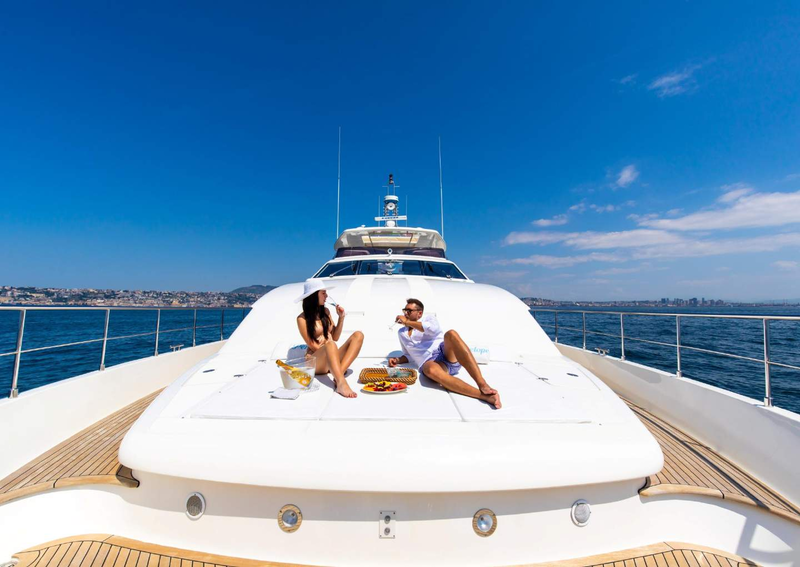 Guests will find warm ambience and deluxe accommodation spread over five lovely suites. 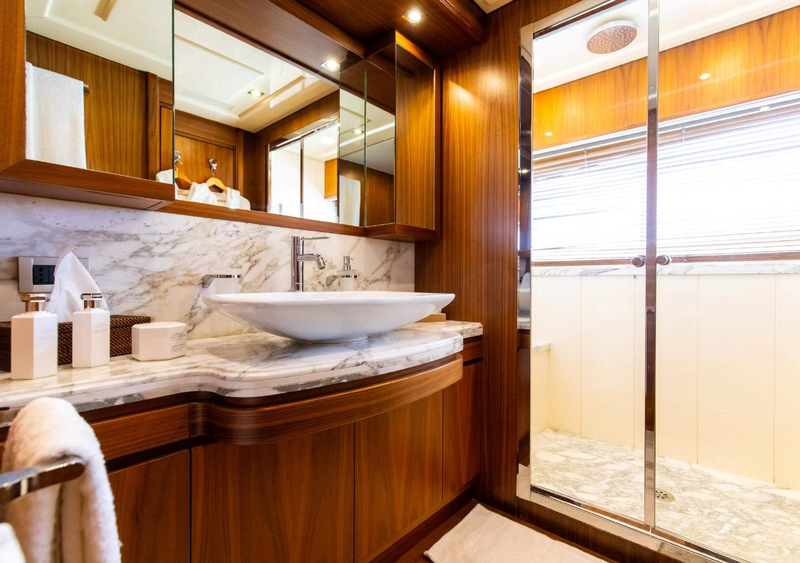 These include a full-beam master stateroom on the main deck with a SAT TV, a large sofa, a vanity/desk and a private ensuite bathroom. 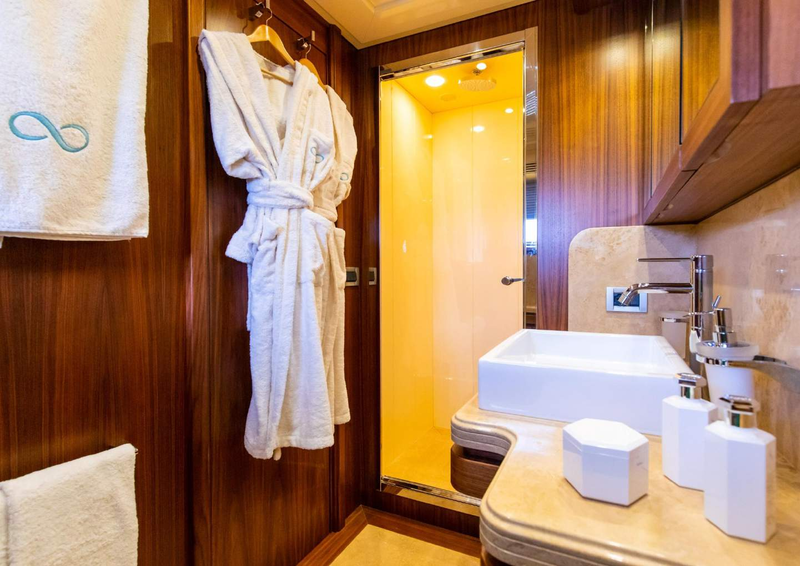 Two double suites with TV and private bathroom as well as two twin cabins with TV and private ensuites are located on the lower deck. 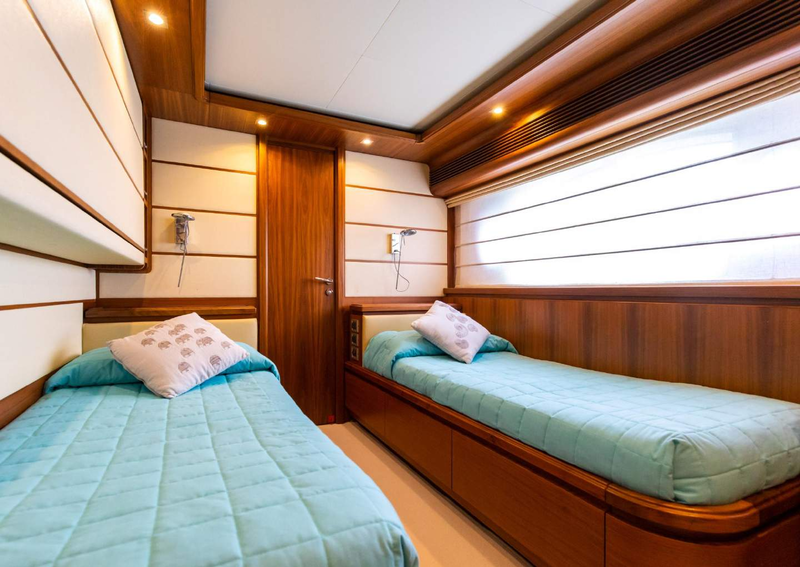 Both twin cabins feature additional Pullman berth which is suitable for nannies or small children.